Boulders and rocks can provide a decorative natural replacement for ugly, messy mulch. Boulders, rocks or flagstone can create a dramatic impact in any landscape. Use them functionally to divert foot traffic, or simply as the focal point in your gardens or waterfall. 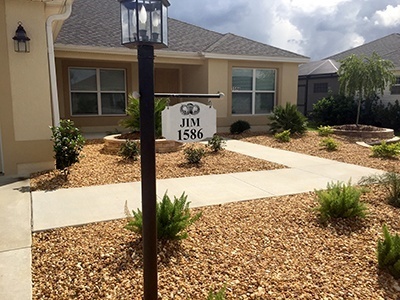 Mansfield Landscaping carries a HUGE selection of natural boulders from all over the United States, but they all look perfect right here in Orlando. Stop by in person at our Yalaha location and browse through our stones. Small rocks and pebbles also make an ideal ground covering in place of traditional mulch. Rocks and pebbles last longer, don't move around and need replacing and come in a wide variety of shapes, colors and textures to meet anyone's taste and anyone's budget. Being in one of the new neighborhoods we were seeing a large number of landscape companies doing work in the area. After talking with several people Mansfield was clearly the company that offered the best combination of quality, price and service. In meeting with Steve he not only offered excellent ideas for a design, but personally walked us through the nursery, pointing out plants and trees that would be good for our project, even to the point of allowing us to select the exact trees to be planted. We especially like Mansfield's practice of bringing a large number and variety of smaller plants to our house so that we could see how they looked with existing plants. The workers were very patient and moved plants around where ever we asked and pointed out ones that would be good or not good together. The finished product far exceeded our expectation and we would highly recommend Mansfield Landscaping.